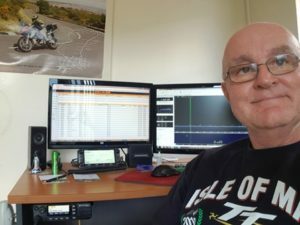 Detailed bio VK4DU – The Radio Amateur Society of Australia Inc.
I’m Glenn Dunstan VK4DU and I live in Cairns, FNQ. I’m the President of RASA. I was first licenced as VK2AFD in 1978, and was involved in the hobby from about 1973 as a SWL. I’m a bit of a traditionalist – I like 40 and 30m CW. Rigs are an RF Space Net SDR receiver and an IC756 Pro 3. I also run a WSPR station on 40m, using VK2RAS/4. The best aspect of AR is that it has lots of aspects…I like system design and operating but I’ve also dabbled in DX-ing, HF mobile and contests. I was a Merchant Navy Radio Officer from 1980-91. I came ashore and served as a Government Marine Radio Regulator in Canberra for six years. Returning to the commercial sector in 1999, I specialised in HF radio network design, running a company designing/installing marine radio stations all over the world. After being a regulator myself, I have dealt with radio regulators in many countries over the last 20 years. I have also been on the Australian delegation for many ITU meetings in Geneva. The RASA committee are very pleased with the way the society is developing. Membership growth has been great. Thank you all for your support. The biggest challenge facing the hobby today is, frankly, apathy. Many amateurs have become licenced SWLs, effectively. Yes, QRM in suburbia can be trying at times, but there are always ways around it…go portable, if needs be. Operating HF from a location with a low noise floor is one of the true joys of AR. If you are listening on your local repeater, and someone calls CQ – please answer them. Call CQ yourself…. The internet and digital technology are becoming increasingly intertwined with AR. WSPR and FT8 are great examples of amateurs developing innovative solutions to the problems of small suburban blocks and high QRM from domestic appliances.